I was literally having a hard time thinking of whom to feature this Music Monday, so I decided to ask a friend about it. So for today am featuring a very cool band that brought the song Desolation for The Watchmen - My Chemical Romance. My Chemical Romance is an American rock band from Jersey City, New Jersey, formed in 2001. The band consists of five members: Gerard Way, Mikey Way, Frank Iero, Ray Toro and Bob Bryar. Shortly after forming, the band signed to Eyeball Records and released their debut album I Brought You My Bullets, You Brought Me Your Love in 2002. 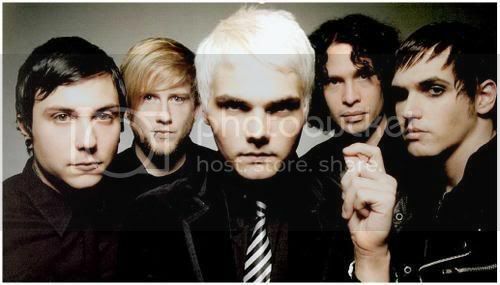 They signed with Reprise Records the next year and released their major label debut Three Cheers for Sweet Revenge in 2004; the album was a commercial success selling over one million copies. The band followed this success with 2006's The Black Parade, featuring their hit singles, "Welcome to the Black Parade", "Famous Last Words", "I Don't Love You", and "Teenagers". The band also filmed a live DVD in Mexico City, which was released on July 1, 2008. I have never heard this song but I have heard of the group.Good song thanks for the visit. Thanks for the visit, I stop by to drop EC too. Have a good week. For me, It's the first time I know this group. Glad to know something new, Metz, Have a nice day! oooh. thanks for featuring my favorite band in the world. i love them.